Over the summer I was working with a case-study who I knew needed to get back into the tub. This person used to take baths galore, but ceased to do so since moving to New York City (read: small bathroom and a not-so-ideal-sized bathtub). I needed to deliver a synergy of essential oils to her via the bath but did not want to bog her down with dilution instructions and cautions that might have kept her from using this beneficial modality (e.g., diluting in a lipophilic substance at x number of drops/dilution rate and why). So where did that leave us? Bath Bombs (a.k.a., Aromatic Bath Fizzies)*! Make it a fun (fizzing!) and therapeutic bathing experience. *There is NOTHING therapeutic about using the word “bomb,” especially when considering the wellness of a sentient being. Hydrosol 5-10 sprays The water element helps “glue” the dry ingredients together (as does the carrier oil). Though beware, as it is a catalyst for the chemical reaction! Measure out the Baking Soda, Magnesium and Arrowroot powder using a scale. Combine the three ingredients together and run through a sieve to ensure no clumps remain. Mix well with a non-reactive spoon to ensure the ingredients are evenly distributed. Measure out the Citric Acid in a separate bowl and set aside. Measure out the Carrier Oil and Essential Oils in a beaker or graduated cylinder. Ensure your essential oils are solubilized in the carrier oil. Pour the wet mixture into the dry mixture and mix to thoroughly distribute the oils. Spritz the mixture with the hydrosol of your choice and mix thoroughly to distribute the moisture amongst the dry ingredients. Remember, you can always add but not subtract—spritz a few times, stir and then see how well the “dough” clumps together. If the “dough” is too wet, add a tiny bit more arrowroot powder. Add the Citric Acid to the mixture and stir evenly to distribute. The citric acid is added at the end of the process as it reacts with the baking soda if water is present. If the water (hydrosol) is incorporated into all of the other ingredients first, it is “tempered down” and will not react (as much/minimally) with the baking soda. Once thoroughly mixed, pack the dampened mixture into your molds of choice. Once firmly packed and formed, place the aromatic fizzies onto a tray lined with parchment paper. The aromatic fizzies will be firm within 2-3 hours; allow 24-48 for them to fully dry before storing them. *Don’t get too fancy—shelf stability matters (e.g., I thought of using liquid coconut milk as a dispersing agent (as opposed to jojoba oil) and determined that would be a bad idea unless I planned on freezing the end product). **Ratio guidelines: 2 parts Sodium Bicarbonate: 1 part Citric Acid: (Optional: 0.5 part Starch: 0.5 part Salts); Dry ingredients should be 90-98% of the product whereas wet ingredients should be 2-10%; NO MORE THAN 2 ML of EOs should be used in a bath fizzy–more than that is wasteful, disrespectful of the plant and could be harmful depending on the EOs used. The therapy of EOs lies in their subtlety (i.e., less means more). Note: Many recipes call for only using the base, acid and alcohol-based witch hazel, many recipes also call for spritzing the product with alcohol (as a fixative), adding dyes and other objects like glitter. While always thinking about the therapeutic nature of the product (e.g., organic ingredients, using coconut milk powder and jojoba for skin softening) you are using/making, also consider how some substances should NOT go down the drain (glitter), how others may stain your tub (e.g., dye) and how it might not be a great idea to immerse your body in questionable substances. Aromatherapy is subtle and therapeutic—this is why I chose to use hydrosols instead of alcohol and/or the witch hazel commonly sold in drug-stores. Yarrow, surviving in my garden despite the clay soil. Yarrow, an herb in the Asteraceae family, has been used for wound healing/vulnerary purposes since ancient times. According to folklore, Achilles (the Grecian battle hero), carried the herb while on battle campaigns to treat battle wounds. This tough (it’s so tough that it grows in the incredibly damp, clay soil of my gardens!) herb can be found throughout the temperate climates of the Northern Hemisphere. It is often seen in the “wild,” though it is commonly found cultivated in many gardens. 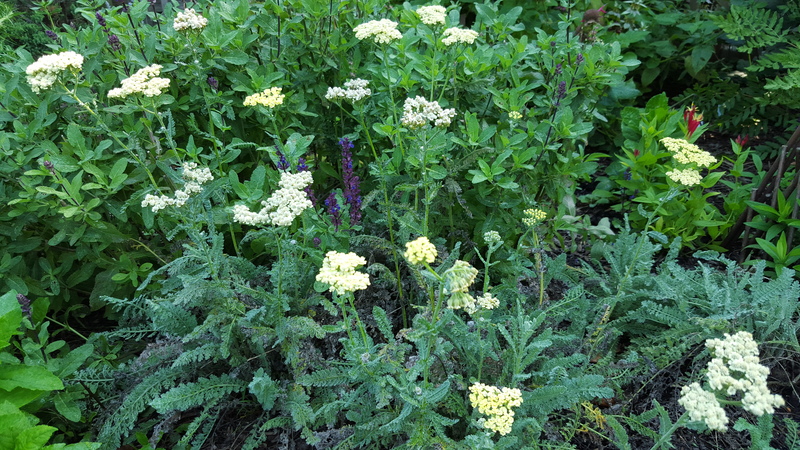 Like many herbs, Yarrow is happiest when its roots are in well draining soil and otherwise “neglected” (e.g., left alone, not fertilized, in lean soil). Yarrow essential oil is steam-distilled from the leaves and flowering tops of the plant. 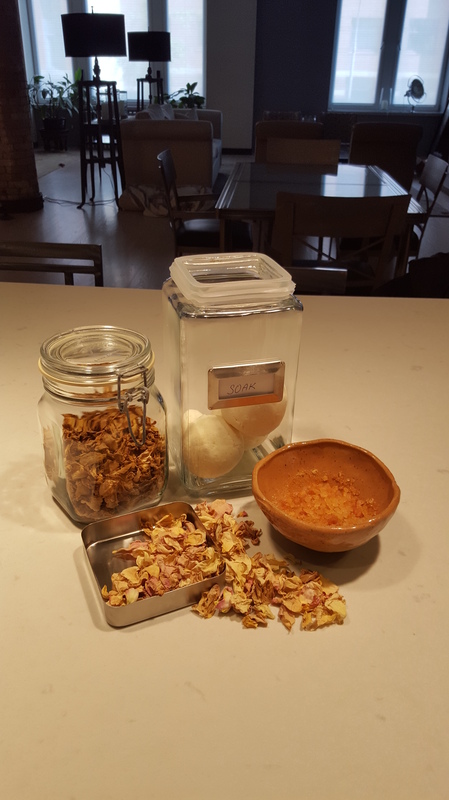 Combine with Helichrysum in a compress for treatment of wounds or skin issues such as bruises or eczema. It helps support the circulatory system (astringent and anti-inflammatory)–combine with Cypress in a salve or compress for varicose veins. It aids with digestion–add ONE drop to a tablespoon of carrier oil (e.g., almond, jojoba) and massage onto a gassy stomach to sooth discomfort (add a drop of Ginger to enhance the carminative effect). Emotional level: it is a balancing oil, useful for transitional times such as menopause, change in relationships, moving to a new location. Put a few drops on a cotton ball and inhale the balancing goodness throughout the day (place the cotton ball in a compact or similar container to keep the oils from evaporating). Add a few drops of Clary Sage to enhance the balancing benefit! Due to its carminative & stomachic properties, using the herb (not the essential oil) in an infusion (i.e., tea) may help with stomach cramps, expel gas or to aid digestion in general. Take a tablespoon of the dried herb (or 2 Tbsp of the fresh) (e.g., leaves & flowering tops-chopped) and steep in hot water for 5-7 minutes (up to 10 minutes for a very strong brew). Sip and enjoy! Try combining Yarrow with Peppermint (and Ginger!) to enhance its soothing & digestive qualities. A fun fact: Yarrow essential oil is a blue oil! As the herb goes through the steam distillation process it becomes blue! This is due to the presences of azulenes in the plant. Clear any residual baking soda from the mouth. Address bleeding gums (post brushing & flossing). Ingredients for a gentle, yet effective, mouth-rinse. Anti-inflammatory and a mild antibacterial agent. Note: AVOID using with children less than 3 years of age. Astringent (stops bleeding) and cicatrisant (healing/scar tissue). Astringent, anti-inflammatory, cicatrisant and antiseptic. Ani-inflammatory, cicatrisant and a mild analgesic. Xylitol counteracts the production of bacteria-loving, decaying acid through a neutralizing effect–it is essentially a plant-based neutralizer. Take a mouthful (e.g., 1 tablespoon) of the rinse and swish around the mouth for 60 seconds. Spit out. Although the mixture is non-toxic, it is wise to spit out and not swallow–the goal is to rid any lingering bacteria from the body. I chose a sterilized 8 ounce bottle because I have them on-hand–go ahead and use any glass bottle (avoid plastic if you can…). Just be sure you can put a cap on the delivery device to reduce oxidation, evaporation and contamination of the mixture. Keep xylitol away from pets, especially dogs. Keep away from children aged 3 and under. 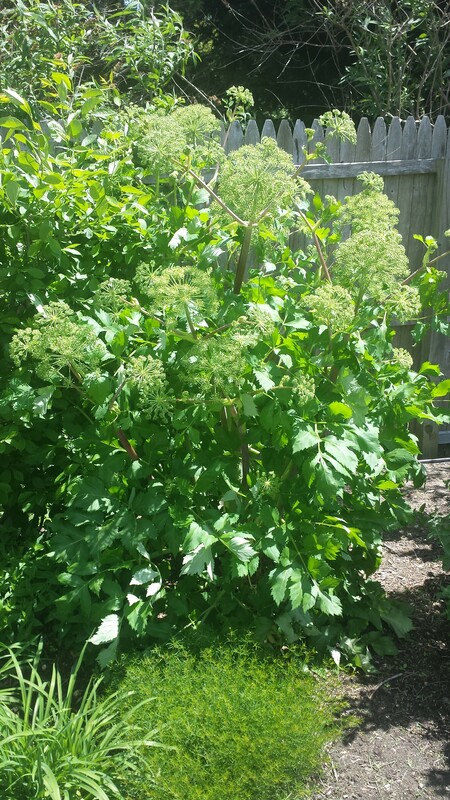 Here is a picture of the beautiful Angelica archangelica (commonly known as garden angelica) that was growing in my garden this summer. I saved the seeds from the umbels and plan on distilling them in a few weeks to keep the water (hydrosol) created from the distillation process. Both the root and the seed are used from this plant for aromatherapy purposes. The plant is a biennial, meaning that it flowers the second year and dies after. Root: Should be used with caution as the oil is phototoxic (avoid use when going into the sun). It is noted for a calming (even sedative) effect on the nervous system–making it great when used in an inhaler for those with anxiety. Seed: It “gets things moving” and is an overall stimulant for the digestive & lymph systems and aids in easing water retention (by promoting movement). Angelica seed would be wonderful addition in a belly rub cream to aid in digestion or on the legs in a cream/body butter/salve to promote circulation for those with edema. Both the root and seed oils have an affinity for the female reproductive system–excellent for PMS and fertility issues. I had a routine dental check-up in late July of 2015 and received bad news–bleeding gums on my lower-right gum-line. As you can imagine this was depressing news. Granted I don’t floss as much as I should. Though I do gargle and brush, twice daily, with national brands of mouthwash and toothpaste. Obviously something had to change, like the products I was using. Over the years the benefits of nut & seed oils (e.g., for oil pulling), baking soda and xylitol have been known but I didn’t pay attention–it was definitely more convenient to go to a store and give a large corporation my money in exchange for oral care I trusted. So I started reading about these ingredients online, in books and in magazines/journals. 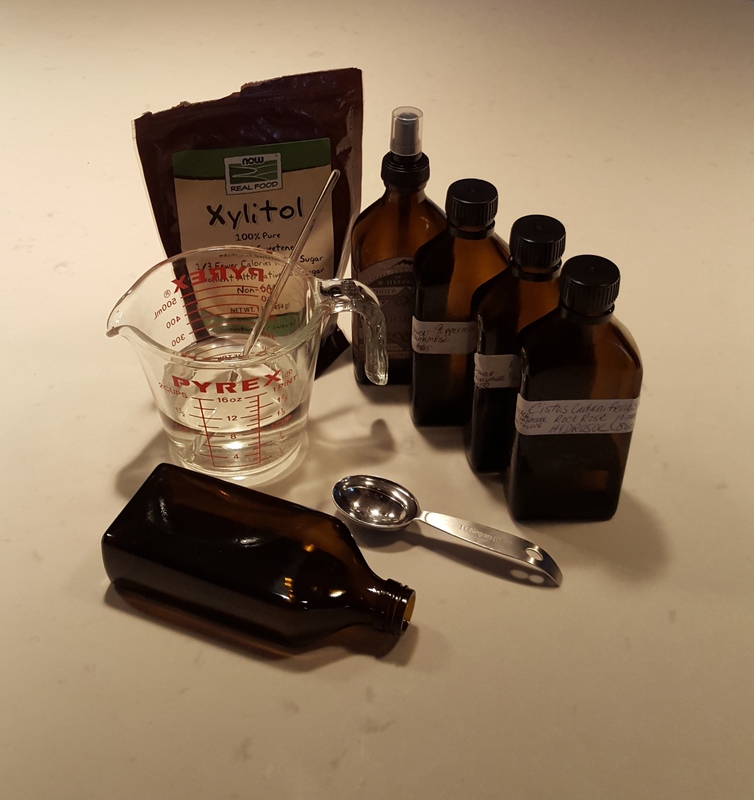 With all of the knowledge I was gaining I had to question–why not make my own toothpaste? And why not enhance that toothpaste with essential oils that are known for oral care? According to a post (about oil pulling with coconut oil) on Web MD: “Most microorganisms inhabiting the mouth consist of a single cell…Cells are covered with a lipid, or fatty, membrane, which is the cell’s skin. When these cells come into contact with oil, a fat, they naturally adhere to each other.” In other words: like attracts like. 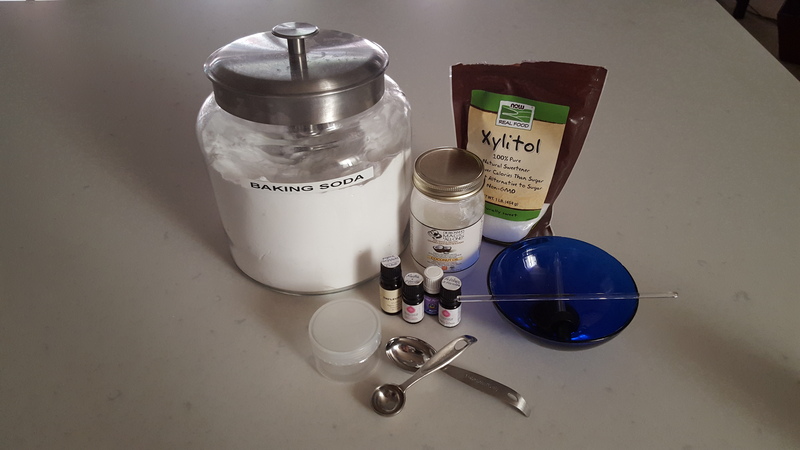 The supplies used to create a simple yet effective toothpaste to address gum inflammation/bleeding. Always combine essential oils in a glass or metal bowl as some oils are pungent enough to eat through plastic. 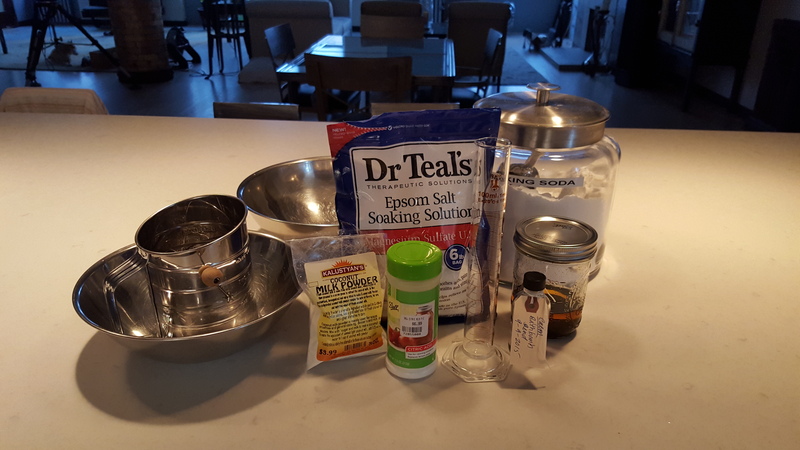 If using plastic, as I did here, first add all of the dry ingredients and coconut oil to the container, then add the essential oils and mix thoroughly. The end product is shelf-stable; avoid contaminating the contents of the jar by using a stick (e.g., popsicle, craft, waxing). I chose a 3 ounce jar because it was on-hand–go ahead and purchase empty tubes, smaller jars, larger ones. Just be sure you can put a cap on the delivery device to reduce oxidation, evaporation and contamination of the mixture. Keep xylitol away from pets, especially dogs.